Three US soldiers have been killed and two others wounded in an ambush in Niger near the border with Mali, reports say. 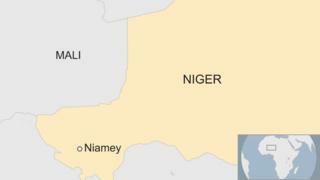 Several Nigerien soldiers are also said to have died in the attack. US Africa Command said the patrol had come under “hostile fire” and was working to confirm the details. The US army has been providing training to Niger’s army to help combat Islamist militants in the region, including the North African branch of al-Qaeda. US President Donald Trump has been briefed by his chief-of-staff, John Kelly, about the attack, White House spokesperson Sarah Sanders said. According to the New York Times, quoting a military official, three Army Green Berets – US army special forces – were killed in the ambush which took place 120 miles (193km) north of Niamey, the capital of Niger. The paper said they were the first American casualties to die from hostile fire since the US Africa Command deployed in Niger. Two wounded US soldiers are in stable condition and will be flown to Germany for treatment, CNN reports. The US has long maintained that its troops play a “train, advise and assist” role with its partners, whether in the Sahel or the Horn of Africa. Its acknowledgement that the troops in south-west Niger were carrying out a “joint patrol” with local forces is being explained as the US providing “security assistance” but it is not clear how broadly this assistance is defined. The attack also highlights the scale of the jihadist threat in Niger, a vast nation with a varied jihadist presence – Boko Haram towards the Lake Chad basin, militants linked to both al-Qaeda and so-called Islamic State in the west and south-west, and the uncertainty from unstable Libya in the north.